The staff at the Middle Brighton Veterinary Centre are very proud to run the clinic to a very high standard. However we do not have the capacity to provide a 24 hour facility. 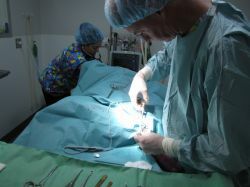 Following complicated surgery or an unstable illness such patients require continual veterinary supervision and care, referral to a local Emergency Centre is necessary. Melbourne is fortunate to have several dedicated Emergency Centres that are able to deal with emergencies and critical care when our clinic may be closed and your pet requires urgent attention. We strongly recommend that if your pet becomes ill during the day, an appointment is scheduled prior to the conclusion of evening consultations. LOST pet? Lost pets in Bayside are taken to the Bayside Council’s Day facility 76 Royal Avenue, Sandringham 9599 4444 where they are checked for all forms of identification (tags & microchips). If an owner is not identified, cannot be contacted or if the animal is collected outside of business hours, it will be transported to The Lost Dogs Home.